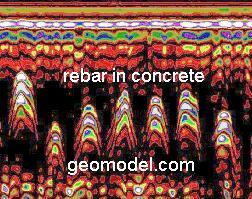 When you need to know what is embedded within concrete, and/or the condition of the concrete, GeoModel, Inc. can conduct a real-time concrete inspection survey. Using ground penetrating radar (GPR), we can locate rebar, pipes, dowels, and plastic, and fiber optic conduits. Our concrete inspection survey can also detect voids within concrete slabs and under concrete slabs. We can scan concrete as thick as 12 to 18 inches and can report on the relative thickness, deterioration, and structural problems. 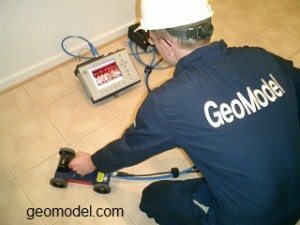 GeoModel uses 1500 MHz and 900 MHz antennas to locate voids, rebar, pipes, or other embedded components during concrete inspection. Our concrete inspector pulls the radar antenna along the concrete surface and observes the radar data on a computer. The image of the concrete is immediately seen on the computer screen and can be interpreted in real time. 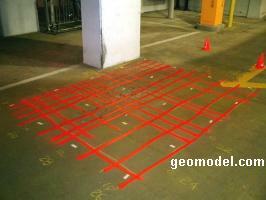 Rebar locations can be marked on the concrete in the field or the GPR data can be simultaneously recorded on the computer for further analysis, processing, and plotting on site maps back in the office.